If you really want the coffee flavor to shine through, I’d recommend brewing a strong cup of coffee or use espresso. 1. In a medium saucepan, combine the butter, sugars, coffee, corn syrup, and salt. Heat to a boil over medium heat, stirring to dissolve the sugar. Insert a candy thermometer into the syrup; boil-stirring only occasionally – until the mixture turns a caramel color and reaches 280 degrees (or almost there! ), about 30 minutes. 2. Remove from the heat, stir in 3/4 cup almonds. Spread mixture onto a rimmed, buttered baking pan, working quickly. Sprinkle the chocolate chips on top of the warm toffee. Cover it with a 2nd inverted baking sheet for a few minutes to keep in the heat. 3. Spread the melted chocolate over the toffee. Sprinkle the remaining almonds on top. Let cool completely. 4. 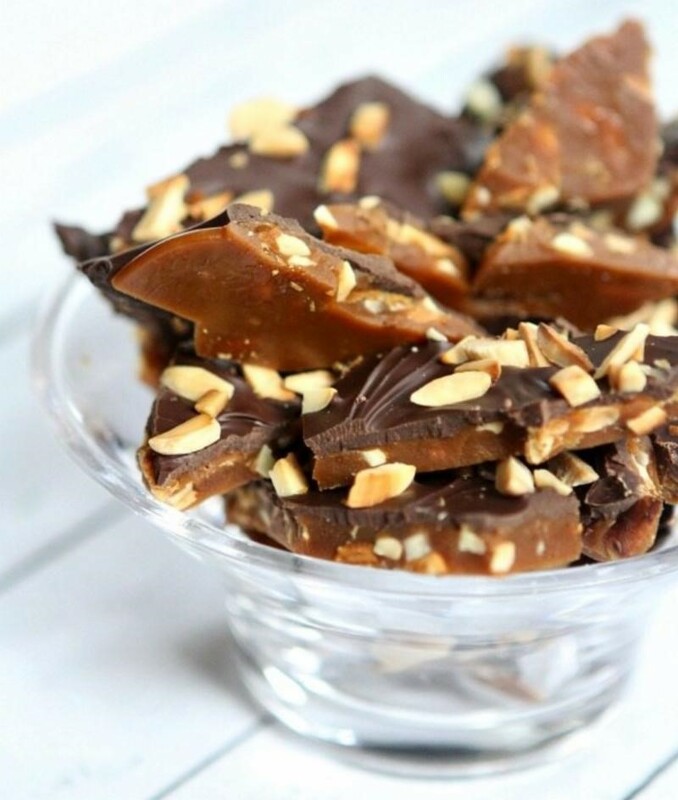 Once the toffee is completely cooled, break it into pieces (you can use a knife to help speed up the process). Store in an airtight container for up to 2 weeks.